Engineering is about making things work, and more importantly, making them work better. It’s also about solving problems. This can mean understanding the science and math behind a material or product. How would you create a machine to deliver hamburgers to customers? How would you design a tall tower? Engineering is fun because you get to use your imagination to create things that don’t exist yet. Engineers use math and science skills to turn a drawing or an idea into reality. In the past century, engineers have changed everyone’s lives by bringing us electricity, mechanized farming, air travel, compact disks, and much more. The challenges of the coming century are even bigger: clean water for everyone, making solar energy economical, understanding the human brain, and many other big questions. Because an engineer must design to meet specifications, he or she must identify the constraints on a design. The challenge may not be to develop a lunch delivery mechanism, but to develop a creative and entertaining scheme to deliver lunch. Not just to design a tall building, but to design a building that can withstand typhoon strength winds. Budget and location are other constraints that affect the final design. This is where the science of engineering departs from the art of design—it is to solve real problems and meet real needs. 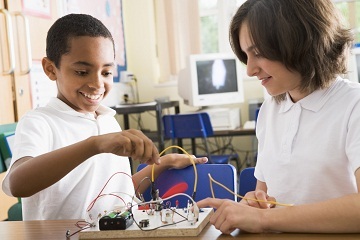 Here are some engaging activities to try your hand at both design and engineering. Find out what it takes to be a great engineer! Knowing the big problems the world needs to solve, you might not be surprised to learn that engineering has dozens of different sub-disciplines: agricultural, biomedical, aerospace, environmental, and nuclear, to name just a few. Learn more about engineering sub-disciplines. If you need inspiration, check out the African American Inventors Curriculum, where youth are encouraged to look at something that already exists and make something new out of it. You can mix and match activities from 13 lesson plans which feature learning objectives, instructions, and a list of supplies. You can try one or several of the lessons, adapting each to fit your schedule and resources. But first, check out our Guide to Getting Started. This little critter’s body is an old CD. It moves very differently from the Blinkybug. Make this dancing bug and see if you can work out why. Download the instructions to build your jitterbug. If you need more help, watch this video of how someone else did it. Developed in collaboration with The United States Department of Agriculture’s National Institute of Food and Agriculture through a cooperative agreement with The University of Minnesota.